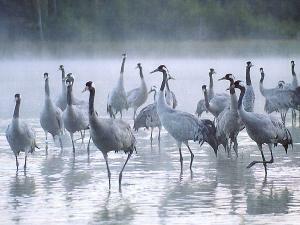 The Great Crane Project aimed to secure the future for the crane in the UK. With the 5 yr reintroduction completed in 2015 the UK crane population is now at an all time high. 180 birds are resident with over 50prs breeding annually - half of these from the reintroduction project. 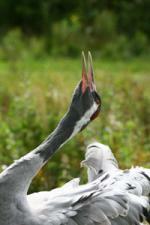 Cranes are wonderful, iconic birds that are sadly missing from many of their former wetland haunts in the UK. They were lost as a breeding bird around 400 years ago as a result of hunting for food and the subsequent draining of their wetland nesting sites. For the 5 years 2010-2014, the Great Crane Project focused on the reintroduction of cranes into the Somerset Levels and Moors - 60,000ha of floodplain in the South West of the UK, dominated by extensive mixed pastures, meadows and wetlands. To get these birds back required the careful hand-rearing of young birds from wild-sourced eggs - undertaken in a purpose built rearing facility at the WWT Slimbridge Wetland Centre in Gloucsetershire. At around four months old the birds were transported to the RSPB's West Sedgemoor Nature Reserve in Somerset and released after a short stay in a purpose built pre-release enclosure. From the day of release they were closely monitored as they learnt to adapt to the rigours of life in the wild. The continued monitoring and protection of nesting cranes is a priority for the Great Crane Project in its post-release phase and a large team of local volunteers are involved in this crucial work. To help the cranes adapt to their new home, habitat improvement and enhancement works were undertaken on land managed for conservation as well as farmed areas in the wider countryside. This work continues into the future. Undisturbed wetlands provide vital nesting areas for breeding pairs and their continued increase and spread across the UK will depend on both the protection of existing wetlands, and the creation of new habitats too. The project's aims were to release around 20 young birds each year between 2010 and 2014 with 100 birds released by the end of the 5yr project. The project came close to this target, releasing 93 birds in total and with survival rates higher than expected, not further releases are planned. To find out more about the progress of the project - please refer to the 'Where are we at?' pages. To hear the crane’s bugling calls reverberating around the moors on a spring morning will be an incredibly moving experience and one that the project wants to ensure that is there for all to enjoy. Visit the Annual Reports page to download in-depth project reports.